FreeEats.com Review: Is FreeEats A Scam? I recently came across a really cool and easy way to make a few extra bucks called FreeEats.com. My first thought was FreeEats has to be a scam, but after signing up and using the site for a few weeks, turns out it’s completely legit and has super quick payments via PayPal. Basically FreeEats pays you to view advertisements on your mobile phone. You also earn a $1 sign up bonus that’s paid via PayPal just a few minutes after signing up. In this FreeEats.com Review I’ll cover how it works, how much you’re paid, how to earn more, and show proof FreeEats is not a scam! Visit FreeEats.com to easily sign up. All you need to do is enter your phone number and zip code! 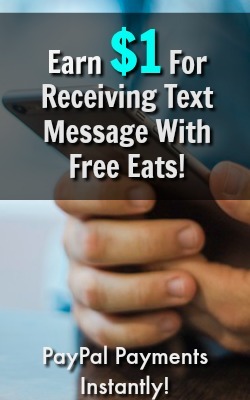 Free Eats will then send you a text message with instructions. After you sign up on their website you will get a text to your mobile device. All you need to do is click on the link in the text. The link will take you to your account homepage. Your account is now linked and you’ll get paid $1 to your PayPal account. Once you’ve confirmed your account and received your $1 PayPal Payment, Free Eats will start sending you ads via text to your mobile device. You don’t have to interact or even look at the text message, you’ll still get paid! As soon as you get an ad sent to your mobile device you’ll get paid, usually $.25, directly to your PayPal account! Continue reading this review to see proof of payment! In this FreeEats Review I gave them a good score and marked it legit. I’ve used this app/site for a few weeks now and have been paid my $1 sign up bonus and $.25 for viewing an ad. It’s super easy to sign up, payments go straight to your PayPal account, and you don’t really have to do anything special to earn some money each month. I highly recommend this site to anyone with a mobile device. You can learn more here. How Much Does FreeEats Pay? You already know that FreeEats pays you $1 for signing up. This will actually be in your account within a few minutes after joining. For every ad that they send to you via text you’ll earn an additional $.25. You also can earn $1 for every person you refer (more on this next). Payments are made via PayPal and usually just take a few minutes to show up after you’ve signed up or viewed an ad! 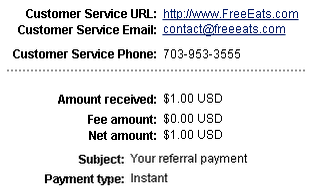 The best way to earn more with FreeEats is through the referral program. FreeEats lets you easily share your referral link on Facebook and other social media sites. They also give you a URL that can be posted on social media or your website. For every friend that joins through you you’ll earn $1! Payments are made within a few minutes via PayPal! I honestly thought FreeEats was a scam before I joined and actually got paid. Below I’ve shown proof of getting paid my $1 sign up bonus via PayPal! Here’s proof you get paid $.25 per text! Earn Your $1 PayPal Payment Here! I did a lot of research on this site before writing this review and really could not find any negative feedback on the site. It seems that everyone who joins is getting their $1 bonus and paid for ads they see, but here’s what I could come up with. FreeEats does not charge you anything to join or for you to receive their text messages, but some people may have extra charges on their phone bill if you don’t have standard text messaging as part of your plan. These days most of my readers have smartphones and most packages include texting so it won’t be a problem. But if you have a dinosaur phone and plan this could be an issue! How Many Ads Can You Get? I’ve only used FreeEats for a couple weeks, but in that time frame I’ve received 3 ads, meaning $.75 in earnings. From what I can see, this is what most people get as well. This isn’t going to be a huge income obviously, but it only takes a few minutes to join and you can earn $1 now and a couple bucks a month just for a few minutes of your time today! FreeEats.com is scam free. I’ve used this site now for a couple weeks and have been paid for everything that I’ve done. Obviously FreeEats isn’t going to make you rich or cover any of your major expenses, but it can earn you a few extra bucks each month. I really like that it’s very easy to join and payments are made almost instantly to your PayPal account. If you’d like to learn more or to earn $1 today visit FreeEats.com! I’m a huge fan of making extra income from multiple sites. To see some sites to combine with Free Eats visit the extra income sites I recommend. If you’re looking for a larger online income, the best way to achieve this is with My #1 Recommendation! Think FreeEats.com is a Scam? Been paid already? Let me hear your thoughts on this FreeEats review in the comments below!